Baths: By your request, we will give your dog a luxurious bubble bath. Prices are based on size and condition. 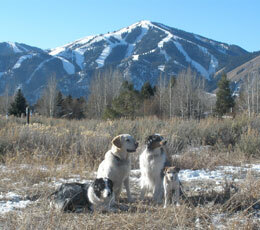 Hikes: We offer two hour off leash hikes on local trails. We require that your dog is off leash trained and under voice command. Walks: We offer one hour on leash walks on the bike path along the river. Your dog must trained to walk on a leash for this service. Pet Pick-up & Drop-off: We offer pet taxi transportation to and from your home or hotel for pet boarding or daycare. Please call us to set up this service. Delivery Service for Pet Food & Medication: Sun Valley Animal Center now offers a delivery service for pet food and pet medications. If you would like to place an order, please call before 3 pm Monday through Friday for same day delivery. The service is offered for any location between North Fork and Woodside. To place an order please call 208-726-7777.